Ntibane Bushveld Hideaway is situated on a private game ranch, nestled among the rolling hills of Kwa-Zulu Natal. 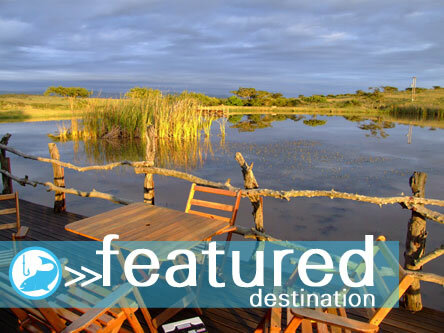 Ideally situated amongst five dams teaming with Florida Bass & Mozambique Tilapia.The fishing couldn’t get any better! The third cottage, situated below the dam, looks out over the bush with the sights and sounds of water rushing over the rocks into the stream below.The cottages are solid stone - cool in summer and warm in winter. Two cottages are set on the waters edge of the main dam with a sprawling deck extending over the water. On-site facilities: Braai facilities per cottage, Communal lapha and indoor braai, limited fire wood supplied. Extra wood may be purchased @ R20.00 per bag. Kids splash pool and play area. Fish the nearby Mkuze river for Natal Yellow fish and Sharptooth Catfish. Easy access by car to cottages. Game drives available on request. Vodacom and MTN reception Accommodation: Each cottage sleeps two adults and two children.Self-catering & fully serviced. Campsites are available with hot and cold running water. Flush toilet. While we mostly refer to the Vaal dam as being in Gauteng it should be noted that this dam has shoreline in Gauteng, Free State and Mpumalanga. This dam has over 800km of bank and is the largest dam in South Africa by area (third largest by volume). For many years the bass population has gone unnoticed but the venue has recently gained popularity with many anglers landing quality fish over 2kgs plus, with the unofficial dam record standing at a whopping 5,1kgs. The most productive areas are in the Deneysville area which holds plenty of structure for the bass to relate to. This is definitely a dam to investigate if you’re up for a new challenge but be very wary when the wind picks as it can quickly turn into gale force conditions. So if you would like to see your favourite dam, pond or fishing destination on our website drop us a line at info@fishingdestinations.co.za. © Fishing Destinations All rights reserved.